The horror! Avert your eyes! Abandon hope! Cringe! All that. 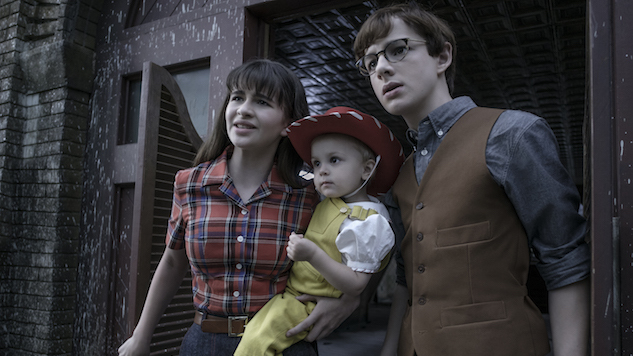 Netflix’s Department of Ruthlessly Sadistic Children’s Programming Experiments has brought us another season of A Series of Unfortunate Events, unfortunately. Yes, bemoan the karma that ensured you had to be alive to see the debut of the second ten-episode installment of relentless misery, vexation and incommodiousness that dogs the three strikingly resourceful and remarkably attractive yet super-duper-doomed Baudelaire children as they leap from frying pan to fire in a clearly pointless attempt to find safety, security, camaraderie and someone who knows the difference between rhyme and pararhyme or that “affect” and “effect” don’t mean the same thing. Woe. Pity. Meh. It’s too horrible to contemplate, but that’s precisely what you’ll do, because this show is still killing it (a phrase which herein means “doing its thing with great aplomb”). Like you, I spend a great deal of time ruminating on what makes a good adaptation, or a bad adaptation, or a faithful adaptation. In the case of A Series of Unfortunate Events it took a while for an adaptation to find its footing (though to be sure, it happened for Daniel Handler much faster than, say, F. Scott Fitzgerald, whose works remain basically untranslatable no matter how hard people try). You probably don’t have to be a bookworm, or a kid, to appreciate this adaptation of a series of ironic, lachrymose, self-parodying children’s stories, because the series is just so damn funny, not to mention seamlessly styled, well-cast and well-acted. It does also happen to be an adaptation that should delight fans of the books because it generally knows exactly how much or how little to deviate from its source material to adapt to the constraints (and liberations) of episodic television. It retains the slightly steampunk, highly absurdist, semi-Gothic and delightfully wordsmithy sensibility of its source material and adheres remarkably well to character and plot. I do have a couple of thoughts on pacing, and this is definitely in the “constraint” column for Netflix. With that caveat in place, I’ll just say this: Neil Patrick Harris continues to be hilariously repulsive, the Baudelaires (Hynes, Malina Weissman and Presley Smith) are still shining exemplars of how being educated and curious can literally save your life, and many of the new characters are gems (I LOL’ed when Nathan Fillion appeared as Jacques Snicket; Lucy Punch is pitch-perfect as Esme Squalor). Sometimes people are ironic to deflect our attention from the fact that they have no real depth. Not Handler, and not this adaptation of his books. This is the real deal, not hipster-distance and disaffection. You can feel it every time a VFD member appears on screen and the orphans get a brief and inevitably tragic glimpse of hope. You can feel it in every turn-to-camera self-reference and every moment of over the top absurdity and the careful placement of moments that aren’t absurd in the least, but actually poignant: The moments between them and Isadora and Duncan Quagmire (Avi Lake and Dylan Kingwell) are gems, as is every minute we get with the regretful but feckless Jerome Squalor (Tony Hale). The TV series continues to pay homage to a book series that celebrates the educated and the sane, independent thinkers and team players, and the pure power of words (and couplets)—and mocks the ignorant and the hive-minded and the bureaucratic into a fine, slightly grainy powder, without cruelty (but with a gloriously generous ration of clever ridicule). Please don’t watch it all at once. Two episodes at a time, max. OK? Then go outside for a little while and it will be fresh all over again. Season Two of A Series of Unfortunate Events premieres Friday, March 30 on Netflix.